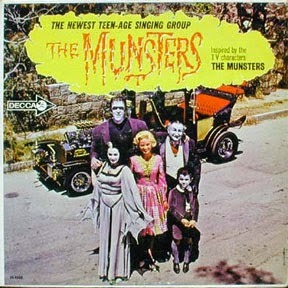 "THE MUNSTERS- "The Munsters" TV show characters are only pictured on the cover, along with their cool George Barris designed 'Munster Koach' custom car, but do not appear on this scarce novelty cash-in, performed uncredited mostly by RCA records surf trio, The Go-Go's: Jim Infield; Roger Yorke, and Bill Wild, pre-Ruben and The Jets. Produced by Joe Hooven & Hal Winn, the guys behind Johnny Crawford's hits, & who later founded the Double-Shot label. Decca Mono." Much of this week's assortment of mid-century lowbrow entertainment isn't sleazy at all. Actually this monster- themed amalgamation of surf, hot rod, novelty, bubblegum, and garage rock is pretty kiddie-friendly and wholesome. The utterly ridiculous "Frankenstein Had A Hot Rod Car" lives up to that boss song title, with lyrics that mention Beatle wigs, and surfing (Frankie "hangs 12"), all set to the tune of "Ol' McDonald had A Farm." But then we have the burlesque bump-n-grind of "Vampire Vamp," which doesn't seem appropriate for children, even with goofy Chipmunks voices added. "Eerie Beach" is an exotica instrumental, complete with birds calls, that isn't eerie or horrific at all. Both were probably leftover tracks the producers had lying around and threw in for filler. Hooray for filler! Theremin-ish electronics and sound effects pop up from time to time. And the last three tracks get down to raunchy garage rockin' (with xylophone) business. Hey, turns out this Friday might be a bit filthy after all. "The Munsters - The Munsters"
I have forwarded this page to a former Miss Gothic Seattle, who shall undoubtedly bring it to the attention of DJ Hana Solo, a top platter spinner at the Mercury at Machine Werks dance club. Ms. Solo plays more unexpected tunes than most in that life-style, so let's hope it fuels her black-phosphorous fire. Wow, they have goth beauty pageants now? (Or are they called 'scholarship competitions'?) That's great, Mr. Ray, thanks for spreading the word. It's stupid, it's shoddy, it isn't even internally consistent...thanks, I'll take it.